7) the excitment of going somewhere new! List 7 things that you love, and then pass the award on to 7 bloggers that you love! Be sure to tag them and let them know that they have won. 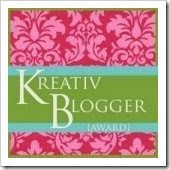 You can copy the picture of the award and paste it on your sideboard letting the whole world know...you are Kreativ!